Dairy is our single biggest category by volume. Milk and milk derivatives are used in many of our products, including dairy and infant nutrition products, as well as ice cream, beverages and confectionery. Milk is an important ingredient in nutrition, as it contains large quantities of first-rate protein, and is also an important source of energy, calcium, magnesium and phosphorus, as well as many essential vitamins and trace minerals. 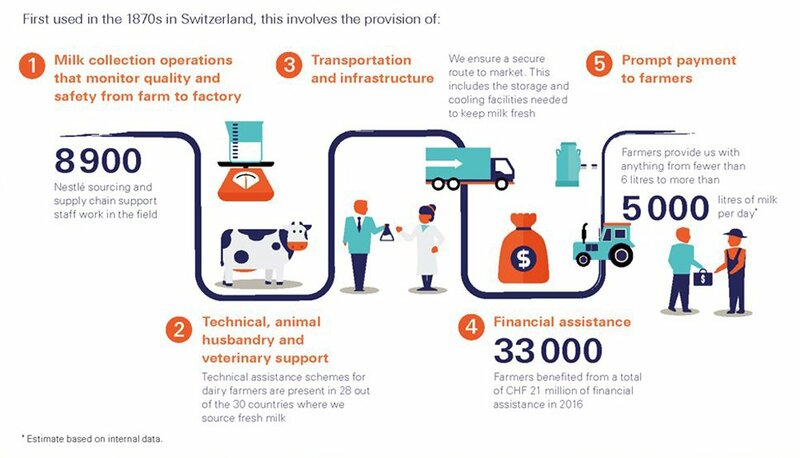 Unlike many of our ingredients, dairy is sourced from around the world, which provides opportunities to help countries to develop quality standards and introduce economic, social and environmental sustainability. We bought 6.6 million tonnes of fresh milk, fresh milk equivalents and dairy derivatives in 2016, either directly from our milk districts (through Farmer Connect) or sourced from Tier 1 suppliers. The dairy industry globally is coming together through the Dairy Sustainability Framework (DSF), which provides a global framework for a holistic approach to sustainability. We strongly welcome and support this, and will play an active role within the DSF. In 2018, we expect to run pilots with our co-operative suppliers while rolling out the Theory of Change (which identifies desired long-term goals, then works back to determine the conditions that must be in place for the goals to occur) to enable better impact reporting in own fresh milk supply chains. Sourcing safe, high-quality milk is a top priority for us. Our milk is sourced from many countries around the world, from small-scale producers to large dairy farms. Each farming environment has different individual, regional or national characteristics and challenges, so we do not impose a one-size-fits-all approach. The relationships we build with farmers enable us to identify their particular challenges, and we work together to resolve them. We also make use of tools such as the Response-Inducing Sustainability Evaluation (RISE) tool to help farmers form a holistic view of the sustainability of their agricultural production at farm level. Where required, we revisit the production system with stakeholders, especially farmers, and help them to transition to more economically, socially and environmentally sustainable production systems. These challenges influence the quality of the milk supply, responsible sourcing and environmental sustainability. Our approach means that whether it’s an individual farmer with one cow in Sri Lanka or a large farming business in the United States, every litre of milk we purchase will meet our stringent quality and safety standards. In order to support markets and co-manufacturers to develop and define the appropriate quality management system, we developed a Hazard Analysis and Critical Control Point tool in 2017. This tool further enables markets to evolve, as it provides them with a locally adapted food safety net to ensure safe, high-quality milk. An integral part of our Farmer Connect programme, our milk district model supports our direct milk sourcing. It helps us develop shorter, more sustainable supply chains and drive positive change through direct relationships with around 306 000 farmers and farming communities in 31 countries across the world. Our dairy suppliers are assessed against our Supplier Code and Responsible Sourcing Guideline (RSG), with a focus on animal welfare, labour practices and environmental impact. We engage with independent auditors such as SGS and Bureau Veritas, who carry out farm assessments using a responsible sourcing assessment tool we developed in partnership with non-profit organisation World Animal Protection. Since the beginning of our programme, we have carried out more than 700 assessments in 18 countries, identifying opportunities and areas for improvement. With the input from our external stakeholders, assessments also help us identify remediation and capacity-building activities. To proactively share with consumers information on the entire value chain, on the work done with local farmers and communities, and on all the projects to enhance environmental sustainability (particularly on water, emissions and natural resources). We recognise and share our stakeholders’ concerns about the welfare of animals raised for food and the need to ensure sustainable animal production systems. Through our Supplier Code and RSG, which contain a specific commitment on this issue, we are helping bring about positive change throughout our supply chains. Our mandatory Nestlé Supplier Code (pdf, 1.7 Mb) requires our suppliers of animal-derived ingredients to meet all applicable laws and regulations on animal welfare. They are also required to communicate this to their suppliers and to the farmers themselves. 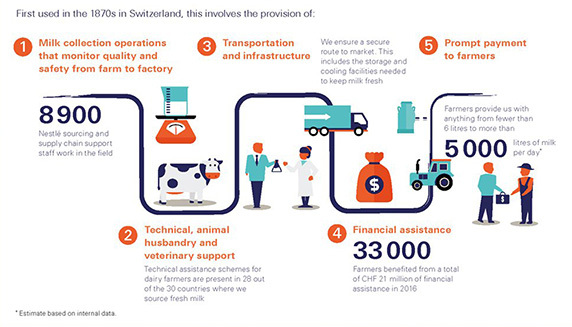 Our Nestlé Commitment on Farm Animal Welfare (pdf, 1.4 Mb) details how we will further improve the health, care and welfare of the farm animals in our supply chain. The responsible use of antibiotics, in line with World Organisation for Animal Health (OIE) guidance. We have prioritised practices and started assessing with our external stakeholders how to best address them. Iran is facing a huge and unprecedented water crisis due to poor water management, declining rainfall, rising temperatures, rapid population growth and inefficient farming practices. Nestlé Middle East and one of the largest crop and dairy farms in Iran – the Chaltasian Farm – have joined forces to find new ways to meet the country’s water challenges. Together, they have launched an initiative to decrease and optimise water consumption in agriculture and animal husbandry. The farm produces an average of 450 m3 wastewater every day. To address this, a wastewater treatment plant was built and inaugurated in 2017. Some 30% of total wastewater comes from the milking parlour, cleaning-in-place systems and calf-rearing water discharges. This waste can be easily isolated and treated through an aerobic wastewater treatment plant. Meanwhile, heavy wastewater – effluents originating from the cleaning of free-stall farm units – is treated to remove solids from liquid. The liquid matter is then stored and used as fertiliser, reducing the need for artificial fertiliser. The solid waste is composted and used as bedding material for dairy cows, or again as a fertiliser. 61% of wastewater from livestock is reused as fertiliser, and 39% refined. In recent years, we have contributed to the stakeholder consultation process on the Business Benchmark on Farm Animal Welfare (BBFAW), a global measure of animal welfare standards in food companies supported by non-profit organisations World Animal Protection and Compassion in World Farming. In 2017, Nestlé remained in the ‘Tier 3: Established but work to be done’ ranking. We participate in an international, multi-stakeholder working group that has developed an International Organization for Standardization (ISO) technical specification (TS) ISO/TS 34700:2016 on Animal Welfare Management. The TS aims to improve the living conditions of animals bred and kept for food production, and provides a management tool for implementing the World Organisation for Animal Health’s (OIE) animal welfare principles. The TS is science-based, non-prescriptive and outcome-based. It will facilitate the integration of animal welfare principles in business-to-business relations between suppliers and customers, and provide a route to demonstrate conformance through additional assurance by an external party. We are working to implement the TS in our supply chain and engage with the OIE to develop further species-specific guidance. *Our milk report for 2017 is published in April 2018, outside the scope of the 2017 CSV reporting cycle, so the 2016 figure is the most recent year for which we have complete data.